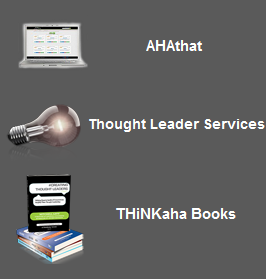 #THOUGHT LEADERSHIP tweet Book01 | THiNKaha: Become a recognized expert in your field of expertise. Compelling thought leadership content. #THOUGHT LEADERSHIP tweet is the winner of a 2012 WPP Atticus Award for Merit in the Public Relations and Public Affairs category! Introduction: What Is Thought Leadership? Section I: What Does It Take to Become a Thought Leader? Section II: What Impact Do You Want This Campaign to Achieve? Section III: How Will You Know You’ve Succeeded? Section IV: What Space Has Already Been Claimed? Section V: What Will Be Your Unique Point of View? Section VI: What’s Your Communication Strategy? Section VII: What Are the Next Steps? #8: A hallmark of true thought leadership is the confidence to take the route that 99.9 percent of industry experts don’t even see. Will you? #31: Thought leaders imagine a desired outcome then ask what has to happen to achieve it. They play “what if?” backwards. Do you? #85: Thought leaders ask “why?” a lot more than “what?” or “how?” Are you asking the right questions at the start? #101: The creators of your thought leadership aren’t necessarily the right ones to communicate it. How will you handle this? #137: How has your thought leadership campaign gone so far? What has it done for your brand? What measures support the anecdotal evidence? Thought leaders advance the marketplace of ideas by proposing actionable, commercially relevant, research-backed, new points of view. They engage in and showcase innovative thinking as opposed to churning out product-focused, brand-centric white papers, or “curated” content that mimics others’ ideas. But while individual thought leaders are in plentiful supply (at least, those who self-identify as such), many organizations struggle to establish their thought leadership approach. If you recognize the importance of differentiating yourself to clients by offering compelling points of view that are intriguing, innovative, inspiring—and wholly relevant to them—this book is for you. Authors Dr. Liz Alexander and Craig Badings, who have more than 50 years of consulting experience between them, have devised a series of questions that will provoke you to consider all the elements necessary to execute a successful organizational thought leadership campaign. The authors have done the preliminary thinking for you so that your organization can better leverage your value in your industry. This book takes a different approach to many who see thought leadership as part of a short-term product marketing, advertising, or PR strategy. It will ensure that you embed thought leadership across the entire organization and centralize it as part of your client-centric culture. Many organizations are squandering time, money, and effort on initiatives that do not move the needle in terms of establishing a differentiated brand identity, deep trust, and loyal followership. Arm yourself with this small yet immensely powerful book and that will no longer be something you have to worry about. 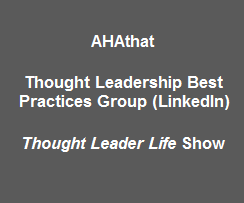 #THOUGHT LEADERSHIP tweet is part of the THiNKaha series whose slim, easy-to-read-and-absorb books contain 140 thought-provoking and actionable quotes (tweets/ahas). 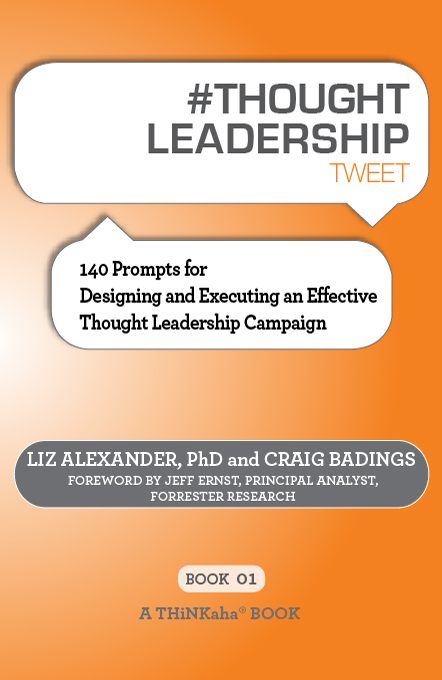 Want a branded edition of #THOUGHT LEADERSHIP tweet Book01 for your company? – Eric Wittlake, Senior Director of Media, Babcock & Jenkins, Inc.
Dr. Liz Alexander‘s (@DrLizAlexander) gift and passion is helping to leverage an individual, team, or organization’s thought leadership, using the book development process as a catalyst. Liz draws on her 25 years of experience as an international business journalist, broadcaster, marketer, educator, and consultant to help corporate executives and other experts produce critically and commercially successful thought leadership books. She has had a distinguished career in the UK as a speaker and workshop facilitator, working with clients ranging from Cathay Pacific Airways to the British Government’s Appeals Service. She also works part of the year with aspiring business authors in India. Liz is the author of over a dozen nonfiction books that have reached close to a million readers in 20 countries worldwide. In addition to consulting, coaching, and speaking throughout the United States and India, Liz develops and teaches courses on strategic communications for The University of Texas at Austin’s Professional Development Center. She earned her PhD in Educational Psychology from UT Austin. She can be reached at info@drlizalexander.com. Craig Badings is passionate about thought leadership, having witnessed firsthand the power this strategy can deliver to brands and individuals. He has spent 25 years consulting to global and local brands about their communication and thought leadership strategies. Today, he speaks and consults on how companies and individuals can employ thought leadership to truly differentiate their brand in the eyes of their target audience. Over the past six years Craig has conducted intense research on thought leadership and has written extensively on the topic. His book, Brand Stand: Seven Steps to Thought Leadership, is the first thought leadership book to outline a methodology on how to arrive at a thought leadership position. Craig believes the traditional way of selling has been replaced by content. Facilitated by the “always on” nature of the web, consumers/clients have changed the way they source information on products and services before deciding to purchase. The trust necessary to move forward with purchasing can be determined by quality, thought leading content. Craig Badings is a partner at SenateSHJ. He has spent years researching, writing and consulting about thought leadership, what it is, what it isn’t and has evolved a methodology for arriving at a strategic thought leadership point of view and taking it to market. Follow his thought leadership blog at www.leadingthought.us.com/blog or on twitter @thoughtstrategy or email him on craig@SenateSHJ.com.au.